The following math course sequence diagrams provide clarity to the variety of options available to San Francisco Unified School District (SFUSD) high school students. 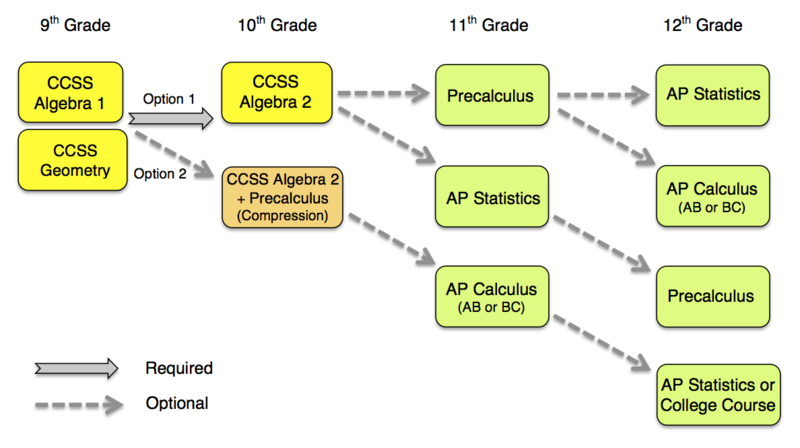 Within each diagram there are multiple pathways for students to progress through mathematics courses, all of which include reaching the most advanced courses (like Calculus AB and BC). It is the view of the SFUSD Math Department that the recommended sequence with the optional Grade 11 compression course, which thoughtfully combines Algebra 2 and Precalculus, eliminates any perceived disadvantage of beginning high school by taking CCSS Algebra 1. This recommended course sequence provides students at many ability levels the best possible opportunity to learn mathematics deeply, and then accelerate their learning at a developmental stage that is more conducive to success. The compression at Grade 11 also reduces tracking by ability through most of a student’s time in SFUSD, thereby ensuring that they encounter both high expectations and peer-based opportunities to learn. However, for families who wish to accelerate their child’s math progression earlier than 11th grade, additional options are available. The sequences illustrated are within the current Math Course Sequence Policy. Additionally, contingent upon funding, SFUSD offers a six-week intensive Geometry course for SFUSD 9th graders who are completing CCSS Algebra 1 in their freshman year and would like to take CCSS Algebra 2 (or Algebra 2 + Precalculus) during their regular academic year as 10th graders. This course satisfies SFUSD’s requirement for a full year (10 units) of CCSS Geometry. Letters are available in multiple languages for families about the course sequence.